Click on the green “Add new Page” button. OPTIONAL: If you want to add a subpage, use the arrow in the levels column to select the page you would like to add to and click the green “Add New Page” button. Follow the same steps below to create the new page. Page Title: Text that appears in navigation for given page. Meta Title Tag: Text that appears in browser tabs. Meta Description Tag: Paragraph that shows in search results. Allow Sub Pages: Allow sub pages to be grouped underneath current page. Is Home Page: Marks page as main landing page - There can be only one Home Page. Display in Navigation: Allows you to hide new pages from showing in the main navigation bar of your website. When you are done, click the green “Add Page” button and you have now created a new page on your site. 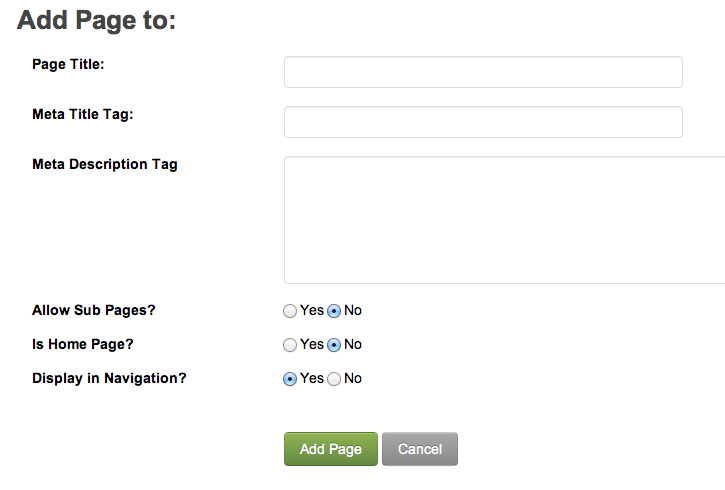 Remember to check “yes” for the Display in Navigation for the page so show up on the nav on the site. If you are in a subpage and you want to go back to the main screen, you can click on the Manage Pages link in the top left corner of the page.